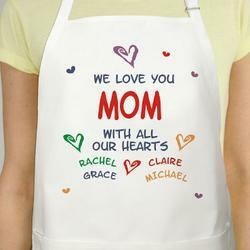 All Our Hearts Personalized Apron is a white full length, 65/35 cotton/poly twill fabric apron. Personalize your apron with any title and up to 30 names. Machine washable. Measures 28" x 30". This product is no longer listed on FindGift.com by this retailer. Check the Similar Gifts section above to find other gifts that may be suitable.